VRI supplies rubber chords in various sizes in the following materials: NBR, EPDM, Viton®, SILICONE, SPONGE SILICONE, SPONGE NEOPRENE. NBR CORDS:-Most cost effective, Nitrile cords have good mechanical properties and mainly used in applications requiring resistance to petroleum oils, minerals oils vegetable oils and inorganic acids. 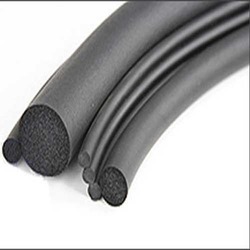 Temperature Resistance: -30 to 100 Deg C.
EPDM CORDS:-Very good ozone and weathering resistance, as well as the resistance to acids and hydroxides with low concentration. Temperature Resistance: -30 to 150 Deg C.